Eleven years later, March 16, 2014, on the anniversary of her death, Rachel Corrie (right) will be remembered by her family and friends. She will also be remembered on this anniversary, by those who celebrate and cherish a young American woman who said no to Israel’s occupation and no to the constant attacks on Palestinians and the destruction of Palestinian homes. Subsequent calls for Congress to investigate Rachel Corrie’s death were ignored. A civil lawsuit brought by her family against the Israeli military, was introduced in Israeli courts, March 15, 2005. The Israeli justice system responded slowly. As my colleagues Jodi Rudoren and Danielle Ziri report, an Israeli judge ruled on Tuesday that the state bore no responsibility for the death of Rachel Corrie, an American activist who was crushed to death by a military bulldozer in 2003 as she tried to block the demolition of a Palestinian home in Gaza. Ms. Corrie, who was a student at the Evergreen State College in Olympia, Wash., joined the pro-Palestinian International Solidarity Movement in January 2003, and was killed two months later in the Gazan town of Rafah, which straddles the border with Egypt. Photographs published by The Electronic Intifada on March 16, 2003, the day she died, showed that Ms. Corrie confronted heavily armored bulldozers that day wearing a bright orange vest and, until a few minutes before her death, using a bullhorn to amplify her voice. The same Web site also published sworn affidavits recorded within days of the deadly incident by three other international activists who were present when Ms. Corrie was killed. “The verdict in Rachel’s case is saddening for all those who knew Rachel, and for all who believe in what she stood for. It should be disappointing for all those who want to see justice done in Israel and Palestine. In the picture at right above, shocked friends from the International Solidarity Movement try to revive a dying colleague. The blue bull dozer continues on its mission to destroy a Palestinian family home. The juxtaposition of the anniversary of Rachel Corrie’s death and AIPAC’s annual Policy Conference, March 1-4, is repeated each year in Washington, DC. It is a coincidence of timing that epitomizes our nation’s shame. American media rarely takes note of the March 16 anniversary of Rachel Corrie’s death. But it will provide ample coverage of AIPAC’s annual celebration of the long time love affair between Israel and the U.S. Congress. Over 400 members of Congress are expected to attend this year’s conference. Some of the representatives and senators will be granted the honor of gaining additional media exposure when speaking to the assembled AIPAC members.. In return for their unswerving obsequiousness, these members of Congress pocket campaign cash contributions and perhaps more importantly, they take home a guaranteed AIPAC PPP (political protection plan). The plan protects incumbents against primary opponents. The plan also guarantees campaign strategists who comb an opponent’s record for the slightest action or statement available to reshape and brand with the deadly anti-semitic designation. Religious groups, like the Presbyterian Church USA’s Israel Palestine Mission Network (IPMN), operate without the protection of AIPAC’s political protection plan. 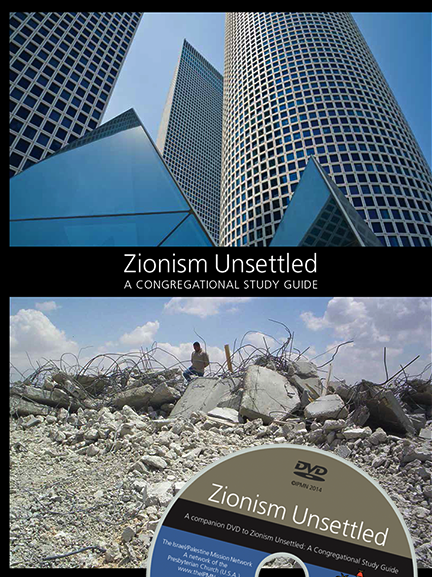 So it was that when the IPMN produced an excellent and well-researched study guide (complete with DVD), appropriately named Zionism Unsettled, a storm of protest rose against them. Modern Israel’s claim to the lands of Judea and Samaria is rooted in a political ideology called Zionism, a political movement formed in the late 19th century. It is not a biblical promise from the time of Jesus. The Zionism Unsettled study guide has both Christian and Jewish Zionists “unsettled”. Chris Leighton, Executive Director of the Institute for Christian and Jewish Studies, produced an “open letter” on February 6, attacking his fellow Presbyterians for not uniting Zionism and Judaism.. I believe your characterization of my sacred tradition is incorrect – and dangerously so. It is prejudicial in the extreme to equate Zionism with Judaism itself. Zionism – that is, the movement to create a Jewish nation-state in historic Palestine – is in fact a political movement that was born in 19th century Europe. As such, it was a conscious and radical break with centuries of Jewish tradition that strongly cautioned against the establishment of an independent Jewish state in the land. While it is certainly true, as you write, that the yearning for a “return to Zion” is suffused throughout Jewish tradition, it is important to note that this yearning was pointedly directed toward a far off messianic future. At the very least, there is a growing desire to allow non-Zionist voices to be part of the Jewish communal debate once more. I trust you would never suggest that these Jewish students are driven by “anti-Semitism.” On the contrary, they are clearly motivated by sacred Jewish values and a courageous refusal to reduce Jewish identity to one political ideology. The usually cautious J Street, which wants to be a friendly version of AIPAC, also weighed in against IPMN’s study guide. Ali Abunimah covered J Street’s surprisingly unfriendly reaction to Zionism Unsettled. When even the usually cautious J Street feels the need to vilify a highly respected Christian group like IPMN, it becomes obvious that the false linkage of Zionism, a political ideology, with classical religious Judaism, is a sagging reed on which the Zionists now attempt to lean. Zionism Unsettled explains why that sagging reed will no longer bear the weight Zionists put upon it. Rudyard Kipling wrote his poem, Recessional, on the occasion of Queen Victoria’s Diamond Jubilee in 1897. Wikipedia reminds us that “The poem defied the celebratory mood of the time, offering instead a reminder of the transient nature of British Imperial power. The first four verses of the poem repeat the line, “Lest we forget, Lest we forget”. The poem is often sung as a hymn in Christian churches. Rachel Corrie was defying an American/Israeli empire when she stood against the destruction of a Palestinian home on March 16, 2003. 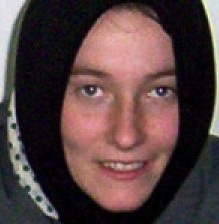 Rachel Corrie, “lest we forget, lest we forget”. The picture of Rachel Corrie at top is a Getty Image. 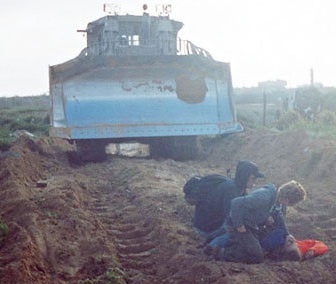 The picture of Rachel Corrie lying on the field after she was struck by the bull dozer, is from the Palestinian Solidarity Movement. This entry was posted in Middle East, Middle East Politics, Presbyterian Church USA, Religious Faith. Bookmark the permalink. Perfection, Jim. Thank you. Rachel, R.I.P. Rachel Corrie and her heroic colleagues will always remain etched in the hearts and living memory of Palestinian history. We Palestinians can never thank Rachel and her family enough for her ultimate sacrifice for our people. May God bless her soul and be with her parents and family. What happened to Rachael was both a tragedy and travesty of justice. The Israelis, whitewashed the case, and took several years to try it, perhaps hoping the family would give up pursuing justice for their daughter. As is typical in Israel, a non Jew will never receive equal treatment under the law as a Jew does. After all this is Israel, an apartheid state, where ones religion determines ones rights. The concept of equality under the law is absent in Israel, as it was in South Africa. American Christians must do more than mourn the death of Rachel Corrie, more than sing, “Lest we forget.” We must do that, of course, But we need to find a way to unite around a strong prophetic protest that will continue to echo until Israeli leaders acknowledge that their “settler first” model of apartheid is bankrupt. The tragedy as I see it is not just that the life of a wonderful woman was snuffed out; the tragedy is the continuation of settlement building, helicopter bombing of residential areas, and the destruction of homes–to name only three. We need to call the Continuing Holocaust for what it is. In memory and honoring the life and witness of our sister, Rachel Corrie, may all the children of the world unite in saying “In the name of God, stop this senseless violence and oppression, and work for peace and justice everywhere!” Stand up, and be counted! We shall overcome! I say “Amen!” to Erv R.’s comment!